On 28 September 2009, the Strategic Airlift Capability (SAC) conducted its first mission in support of the International Security Assistance Force (ISAF) in Afghanistan. The first ISAF-related flight by SAC's operational component, the Heavy Airlift Wing (HAW) based in Papa Airbase in Hungary, delivered materiel to Mazar-e Sharif, to supply Swedish troops in the Afghan theatre. The HAW has already flown several operational missions, including flights to support KFOR troops in Kosovo, but the first trip to Afghanistan was an important milestone for the SAC program, which was launched three years ago in order to acquire three C-17 aircraft, to meet strategic airlift requirements of the 10 participating member nations. "The first mission to Afghanistan is a big step forward for the efforts of the SAC nations, including both NATO and EU members, to address a critical shortfall in strategic lift," said Mr Peter Flory, NATO Assistant Secretary General for Defence Investment. "This is what it's all about, conducting missions for our member nations. It is a team effort and I am very proud of the close cooperation among the 12 nations within Heavy Airlift Wing (HAW) and NATO Airlift Management Agency (NAMA)," said Col Fredrik Heden (Swedish Air Force), HAW Vice Wing Commander. Launched in September 2006, the SAC initiative is a groundbreaking example of multinational cooperation in rapidly developing critical capabilities for the Alliance and other SAC members. The aircraft meet the strategic airlift requirements of the SAC member nations for national missions, including missions in support of NATO, the EU and the UN. The first SAC C-17 Globemaster III (SAC-1) was delivered to Papa Airbase on 27 July 2009; SAC-2 arrived in Papa on 21 September 2009. 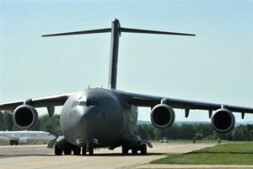 The third SAC aircraft, which is scheduled to be delivered in October 2009, will complete the projected SAC C-17 fleet. The SAC currently comprises 10 NATO and two Partnership for Peace (PfP) nations: Bulgaria, Estonia, Finland (PfP), Hungary, Lithuania, the Netherlands, Norway, Poland, Slovenia, Sweden (PfP), Romania and the United States. NATO Summit In Bucharest: A Glass Half-Empty Or Half-Full?